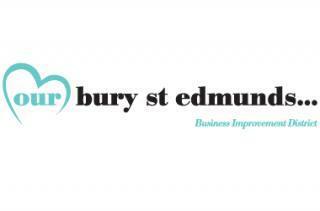 Some of the most famous names to have graced the stage at Theatre Royal, Bury St Edmunds, are to be commemorated in a new trail around the town promoted by Our Bury St Edmunds which runs the Business Improvement District (BID). The Theatre Royal Star Trail, which has already raised close to £10,000 for the theatre, will see stars placed on the pavement in prominent positions in the town centre – not unlike the world-famous Hollywood Walk of Fame. On World Theatre Day (March 27) those behind the project gathered to officially launch the Trail – which will be put in place on the streets in May – and thank the sponsors who have so generously come forward to support the project. Sponsorship of the trail will go towards the £170,000 the theatre needs to raise each year to support its operating costs. Joining Karen, Andrew and Mark at the Theatre Royal to help launch the Trail were Julia Read, Head of Development at the theatre as well as Vince Canning and James Archer from Coastline Graphics in Bury St Edmunds which is a sponsor of the Trail and is also making the stars to be used. Sponsorship opportunities for three remaining stars are still available and potential sponsors should contact Julia Read at the theatre on 01284 829942.